Expect it to be followed by a production version of the FT-AC Concept we saw in LA. Aside from and a new body-on-frame chassis, hardly a peep has come out of Toyota regarding its plans for its next generation of trucks. Left to its own devices, both the Tundra and the Tacoma will age like a Nissan and remain in the market until obsolescence sets in and kills them off. That’s why a new Tundra is top priority for the automaker according to what group vice president and general manager of the Toyota division, Jack Hollis, told . With a new Camry and a slew of crossovers keeping the more vibrant Toyota segments abuzz, a redesigned Tundra to replace the current one, which was last updated in 2014, is next on the checklist. “I don’t think there’s [a] much higher priority than that,” said Hollis. 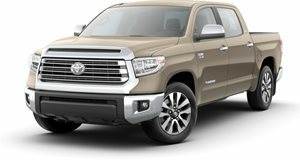 “Tundra has been out for plenty of time so we’re looking at what the new one would look like.” Given Toyota’s reputation for reliability, the Tundra’s redesign is not a feat the automaker takes lightly. It previously highlighted a Tundra that had been driven for over a million miles with hardly a need for repairs, and that ethos is one that Toyota aims to keep in the new generation. Meanwhile the resurgence of the midsize truck has not yet influenced the future of the Tacoma. With the third generation Tacoma having debuted in September of 2015, age is beginning to become a factor but it has yet to put a dent in sales. In fact demand is so strong that Toyota recently opened a new Baja California, Mexico plant to build 40,000 Tacomas per year and ease the burden on its San Antonio, Texas plant, which is already running at over 100% capacity. But what about models like the ? Hollis likened it to the FJ Cruiser, saying, “Customer feedback was so strong, what did we do? Got the product out in about two years that looked almost identical to the product we brought out on stage,” said Hollis. “I would put FT-AC in a similar boat.” Oh goody.